"We have to give everything...even if that means our lives. We will stop at nothing! We will fight for the lost!" 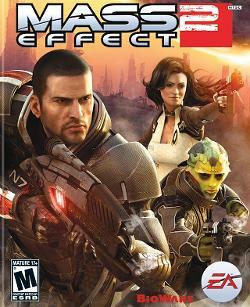 The second game in the Mass Effect series. One month after the first game, the Normandy is viciously attacked and destroyed, killing Commander Shepard in the process. Two years later, Shepard reawakens and learns that Cerberus, a mysterious human-supremacist organization, has retrieved and revived him/her at great expense in order for him/her to continue the fight against the Reapers. Meanwhile, human colonies are vanishing, and Shepard learns that the Collectors, an enigmatic and advanced alien race, are behind it. Forced to work with Cerberus and their leader, the Illusive Man, Shepard must assemble a team and take the fight to the Collectors. They call it a Suicide Mission. Prove them wrong. Structurally, the game is much more of a Wide Open Sandbox than the first. You get two starting party members Miranda Lawson and Jacob Taylor, and your spaceship, and then are given free rein to recruit any or all of eight other squadmates (ten counting DLC), including two from the first game. Once they have been recruited, they eventually present you with an optional "Loyalty Mission", a personal Sidequest that provides not only the RPG standard rewards of cash, EXP and new gear, but Character Development and unlocked powers for the party member in question. Interspersed between these various Fetch Quests are several investigations issued you by the Illusive Man, in which you examine the Collectors, figure out where they came from and what they're up to, and eventually travel through the Omega-4 mass relay to strike at their home base. While completionists will want to recruit everyone and upgrade everything, people in a hurry (or playing the Renegade path) can jump through with minimal support and training, and still win (though Reality Ensues in terms of how many people survive). There is a great deal more interactivity with this game then there was with the first. The big thing is that if you import a character you played from the first game, you take with them all of the choices they made and the people they interacted with as being a part of this game in some way, ranging from your romantic option still having feelings for you to very minor characters who you barely recall talking to. The Paragon/Renegade options are more reliant on the choices you make: acting like a Paragon gives you a higher Paragon score and the same with Renegade, and the higher score gives you more opportunities to use them (in the first game being able to initiate a charm or intimidate option was based on how you allocated leveling points). It was also spruced up with the addition of "Interrupts," essentially Quick Time Events that allows Shepard to interject an optional Paragon or Renegade action into the proceedings (such as shutting someone up pre-emptively, or hugging someone in pain). These may make your mission harder or easier, but you get an extra reward for using them. On the gameplay side, many things were refined. Neither you nor your squad members are given weapons you are incapable of using properly. Weapons themselves require "Thermal Clips" for everything except the heavy weapons (meaning part of the game is looking for more ammo), and as your preferred gun runs out you are forced to switch to a less-preferred gun. The Take Cover mechanic is a vital element and you will not last long without using it. The armor and equipment of the characters is a uniform system that depends on technology you gather during your missions, and while you can change their look (at least one base outfit and another when their loyalty mission is complete), it is purely cosmetic. You are given the option of leveling up a character and changing their weapons before every mission, and leveling up is a tier based system, each additional level requiring more points to acquire it. The combat abilities are simplified in there being less variety of attacks to use, but there are also more variations available between the different classes (for example, you have three full biotics on your team, each with different biotic-based abilities). The series has spawned Cerberus Daily News, a defictionized news site that (used to provide) daily updates detailing events in the Mass Effect universe, most of it having no bearing whatsoever on the story in the first two games. It also hosts forums full of roleplayers who constantly react to said news and act out in-universe storylines of their own making. Finally, there is a proliferation of Downloadable Content: two new squad members, at least two stand-alone side missions, and a number of weapon packs, armor packs and alternate costumes for Jack, Thane, Garrus, Miranda, Grunt and Tali. The most important bits of DLC though are Lair of the Shadow Broker and Arrival, which Bioware call "bridging" content because they help to set up Mass Effect 3. Both of them add completely new story events to the game. The former includes Liara as a temporary squadmate as you storm the lair of the Shadow Broker; the second is a Shepard solo mission as you rescue an undercover Alliance operative who has discovered proof that the Reapers are coming--soon—and needs help preventing their eponymous Arrival. To say that the game has been given positive reviews is the poster child of Understatement Calendar 2010. According to BioWare, the game has over forty perfect scores and game of the year awards, and that was before the game came out on Play Station 3. The only complaints were that most of the game was spent recruiting for the Suicide Mission, that the combat felt samey, and that the subtitles were too small. Seriously. ↑ In the lead-up to the release of Mass Effect 3, the in-game Cerberus Daily News, seen on the main menu screen, was reactivated after a full year with no updates, with small snippets of information about comm buoys going off-line as the Reapers prepare their invasion.